Fantech’s versatile FR Series Inline Fans provide the ideal answer for a variety of air movement problems in residential and commercial applications. The fans feature a plastic housing constructed of UL-recognized, UV protected thermoplastic resin. This tough protective shell allows the fan to be mounted in outdoor and wet locations**. FR fans feature external rotor motors that have proven dependable year after year. Fan is fully caulked to prevent moisture from entering the housing. FR fans can be used for multiple point exhaust applications, bathrooms, new additions, crawl space venting or make-up air supply. 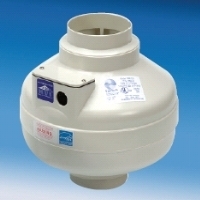 They are also widely used as booster fans to move air from one room or area to another. **The FR Series is not manufactured to operate with water running through the motor compartment, or to be used in applications where the fan would be buried underground. A UL-recognized waterproof conduit should be used for all outdoor applications to prevent moisture entry via knockout in wiring box.